Bulbs 2-6, usually borne on short rhizome, ovoid-conic, 1.5-6 × 1.5-3 cm; outer coats enclosing 1 or more bulbs, brownish to grayish, reticulate, cells finely fibrous; inner coat white, obscurely cellular, cells irregularly arranged. Leaves ephemeral, usually absent at anthesis, 2-3, basal; blade solid, flat, elliptic to elliptic-lanceolate, (15-)20-30(-40) cm × 15-90 mm, tapering to long, slender petiole, margins entire. Scape persistent, solitary, flexuous distally, terete, 10-40 cm × 2-4 mm. Umbel persistent, erect, loose, (6-)30-50-flowered, obconic to ± hemispheric, bulbils unknown; spathe bracts persistent, 2, ± 3-veined, lanceolate to lance-ovate, ± equal, apex acute, beakless. 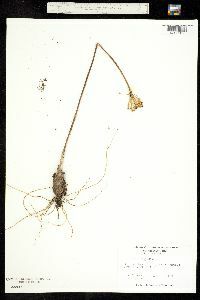 Flowers campanulate, 4-7 mm; tepals erect, white to cream or yellowish, oblong to ovate, ± equal, not withering in fruit, margins entire, apex obtuse; stamens ± equaling tepals; anthers white to light yellow; pollen white; ovary crestless; style included, linear, shorter than stamens; stigma capitate, scarcely thickened, unlobed; pedicel 10-20 mm. Seed coat shining; cells smooth. Perennial herb with two to six bulbs flowering stem 12 - 40 cm tall Leaves: two or three, basal, stalked, 15 - 20 cm long, 2 - 9 cm wide, flat, lance-shaped to elliptical, dying back before flowering time. Leafstalks long, narrow, and reddish. Inflorescence: an upright, more or less dome-shaped umbel of twelve to fifty flowers raised on a single narrow stalk and subtended by two, 2 - 3 cm long deciduous bracts. Flowers: white to cream-colored, 4 - 7 mm long, bell-shaped, with six tepals that remain even in fruit. Fruit: a three-lobed capsule. Bulbs: up to 6 cm tall, somewhat oval, and encased in a brownish or gray netlike coating. 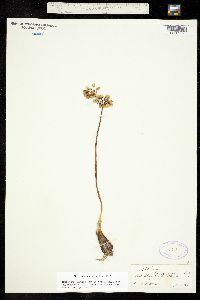 Similar species: The leaves of Allium tricoccum are gone by flowering time, which distinguishes this species from other Allium in the Chicago Region. Also, the leaves are typically wider (over 1.5 cm). The variety burdickii differs by having much shorter leafstalks that are not reddish and leaves that are less wide. Habitat and ecology: Common in mesic woods, especially in the eastern part of the Chicago Region. Notes: The name for the city of Chicago is derived from the Native American Miami-Illinois word "chicagoua," which means "striped skunk" and was also used in reference to the smelly wild leek, Allium tricoccum. The Miami-Illinois commonly named rivers after conspicuous plants in a watershed. "Chicagoua" was their name for the Chicago River. This name was later adopted for the town located at the mouth of the river, Chicago, which was incorporated in 1833. Etymology: Allium comes from the Latin word for garlic. Tricoccum is a combination of tri meaning three, and coccum meaning berry, which refers to the three-lobed fruit. Bulb ovoid-conic, its coats finely fibrous-reticulate; lvs flat, lance-elliptic, (1-)1.5-3+ dm, withering before anthesis; umbel erect, subtended by 2 ovate deciduous bracts; tep ovate to oblong-obovate, white, 4-7 mm, obtuse, about equaling the stamens; epipetalous filaments widened below; fr depressed, deeply 3-lobed, each valve often gibbous on the back below the middle; 2n=16. Rich woods; N.S. and s. Que. to Md. and in the mts. to n. Ga. and n. Ala., w. to e. N.D., s. S.D., and Mo. Two well marked vars.